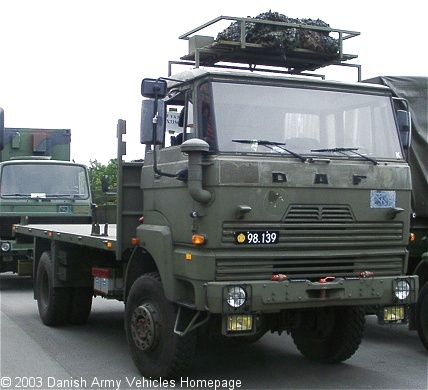 Danish Army Specific: The shown vehicle is used by the Deployable Communications Modules Company (India) based in Haderslev. A communication container will probably be mounted on the truck. Historical: The DAF YA 5441 truck was designed to carry 5.000 kg of cargo on both roads and across country. It was developed from a standard commercial design and uses many components of the YA 4440 series. A second production series with slight modifications from the YA 5441 is the YA 5442 produced from 1984. Standard equipment includes a front bumper with a built-in push/pull pin, rear towing hook, exhaust brake retarder and connections for the brakes on the trailer. Length: 7.60 m (296 inches). Height: 3.45 m (124 inches) (with shelter). Weight: 12.700 kg (27.940 lb.). Engine: Own 6-cylinder, type DT 615, 6.099 cm3 (372 cubic inches), turbo charged, liquid cooled. Horsepower: 153 at 2.400 rpm. Transmission: 5-speed, ZF type S5-35/2. Transfer case: 2-speed, ZF type VG250/2. without preparation: 0.6 m (23 inches). Additional: ZF 8065 power steering.